While we all love to swoon over the latest and greatest gadgets and apps from Apple, Mac OS has many features most of us have never really used, although they’ve been there for quite some time. One of these “hidden” features is the Finder’s Get Info window. Select any file in Finder and hit Command ⌘+I to bring it up. The Get Info window is more than a simple display of a file’s properties. It has loads of functions, some of them are just more obvious than others. Let’s dive into the nooks and crannies, top to bottom. The fun begins right at the top: Next to the file’s name, extension, file size and modification date you can see it’s icon. Try clicking it. See the blue “aura” surrounding it? This means the icon is selected and can be copied and pasted. Want to change a file’s icon? Simply open up the Get Info window of a file who’s icon you want to assign to a file, select the icon, hit ⌘C, select the icon in the target file’s Get Info window and hit Command⌘ + V.
The next section is Spotlight Comments. You can enter keywords (or “tags”) to describe the contents of the file which you can then use in a Spotlight search. For example, say you create documents each year to help you do your taxes. For easy future access and filing, you could add the keywords “taxes” and “2018″ to any file related to your 2018 taxes. 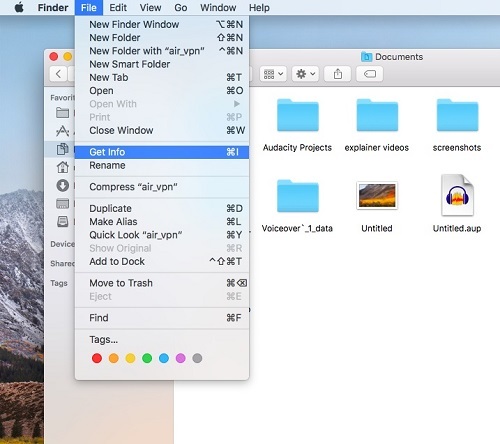 That way you don’t need to keep all these related files in a single folder, but you can still be able to find them with a simple Spotlight search. The next section groups some basic file information: the kind of file (for applications it also shows whether the app is Universal or PowerPC), its size (or remaining space for a disk) and location (for an alias the location of the file the alias is pointing to is also shown), when it was created and last modified. Below that data you can easily assign a color label to the file. You can set the color and text of these labels in Finder’s preferences. They make for a handy way of grouping files. For example, I have a label called “Reading” which I assign to all the files (ebooks, documents etc.) I still want or need to read. I put a Smart Folder in my Finder’s sidebar which shows me all the files labeled “Reading” at a glance. Finally, you’ll find two checkboxes at the bottom of this section who’s purpose aren’t immediately obvious. The first one, Stationary Pad, is for telling an application that accesses this file to first make a copy of the file before opening it. That way the file acts as sort of a template. It’s protected from being modified but you can create a new file based on it. The second checkbox (”Locked”) is simply for making the file read-only. A locked file can be read but not overwritten. What data the next section displays depends on the type of file that you selected. For example, for an image file the More Info section shows the file’s dimensions, color space, alpha channel and when it was last opened. For a Pages file, this section shows when it was last opened. For any file downloaded with Safari, this area shows the URL where the file was downloaded from. Try it with some different file types to see what kind if info shows up. The Name & Extension section lets you change the file’s name and opt for showing or hiding the file’s extension. Internally, the file’s “real” name always includes its extension. This option only toggles whether or not to display the extension in Finder. The section labeled “Open with” lets you determine which application to launch when opening the file. Internally, Mac OS keeps track of which application created a file and by default the file is then always opened with that application. This is independent of the file’s extension, by the way. For example, JPG files created by Photoshop will have the creator set to Photoshop, while another JPG may have been created in LiveQuartz, with the creator set to the appropriate value. What if you want to always launch .jpg files with Photoshop? That’s what the “Change All…” button does: click it and all files with the same extension as the currently selected file will launch with the application selected in the dropdown list. But be careful! Indiscriminate use of this button may have uninteded results and there’s no easy way of undoing the association once it’s been changed. Keep in mind that some applications may use the same extensions for the files they create, although they have totally different data in them. So, for the .jpg example above, it would probably make sense to launch them all with the same app. But be careful for .txt or any extension you’re not familiar with. The next section gives you a preview of the selected file’s actual contents. You can also use this preview image to copy or move the file. Simply click and drag it to the desired location; it works just like select the file itself in Finder. For audio files and movies, this section shows a miniature QuickTime Player, which lets you preview the media file right in the Get Info window. The “Languages” section only shows for applications and lets you determine which interface languages an application should support. You can regain some disk space by deleting any language here you are absolutely sure you will never need. Simply select the language you want to remove and click the minus button below the languages list. 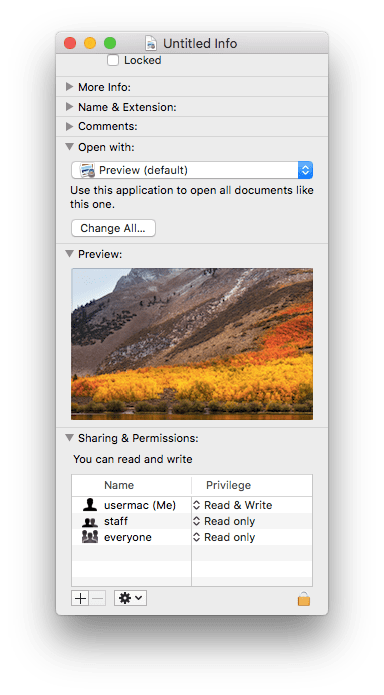 The final section is for changing the permissions of the selected file. To change any settings here, you will need to click the small lock image in the bottom right corner and enter the administator password. You can add single users and groups of users to the list and give them either Read Only or Read & Write permissions. The pseudo-group named “everyone” is for setting the permissions for any user not defined in the permissions list. One final tip: normally, when you select multiple files and use the Get Info command, a separate Get Info window opens for each selected file (for up to 10 files). If you want to have a single Get Info window for all the selected files (for example to determine their total combined size), simply select all the files and press ⌥⌘I.